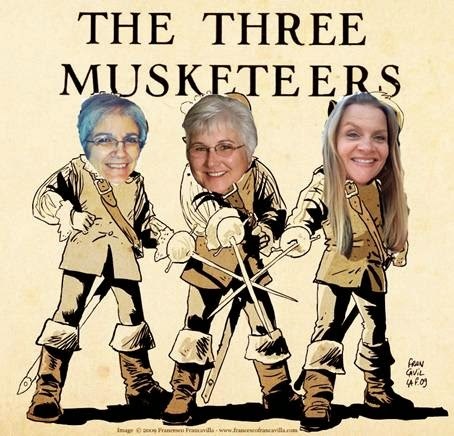 I have the distinct pleasure of being part of a blog group - the Calendar Girls. 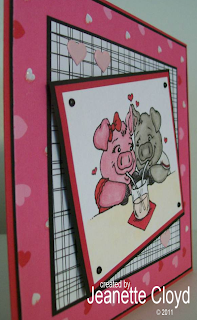 We are a group of ten online friends who love to make cards. 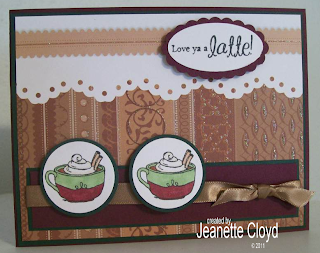 We encourage one another in our creativity and we just love hanging out together on Splitcoast Stampers. Each month, one of the Calendar Girls is the hostess of our challenge, which we post to our blogs on the 28th of the month. That simply means that she is the one who determines the parameters around which we will make our Calendar Girls card. “SEW” Glad We Are Friends!!! Because I just love this entire group and it feels that we have been friends forever, I just wanted to say…”Sew” Glad We Are Friends! So for this month’s card here are the requirements. 3. Please have stitching of some kind on your card. 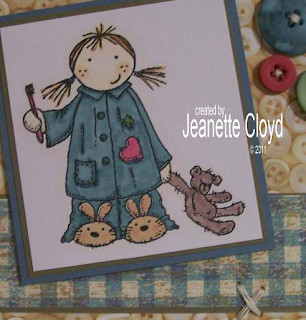 You can use a sewing machine, hand stitching or faux stitching using a pen. 4. 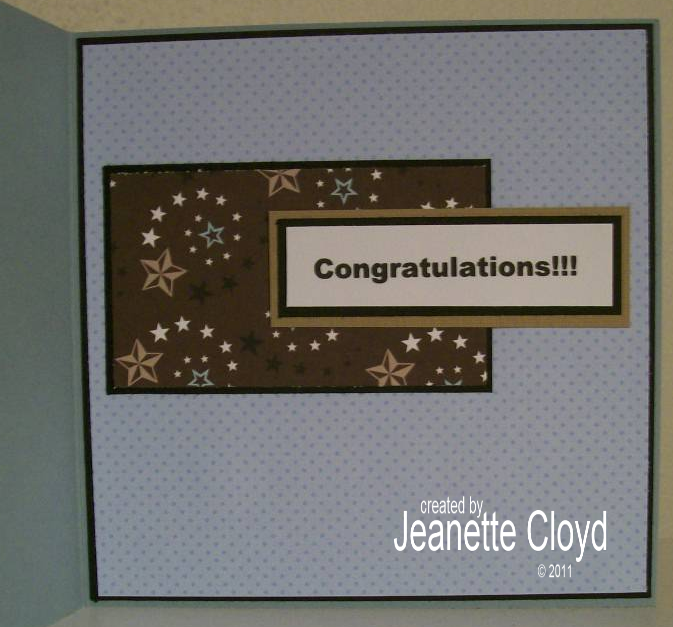 Once your card has posted to your blog, please send your card to a friend telling them how much you appreciate them and that you are “sew” glad you are friends! 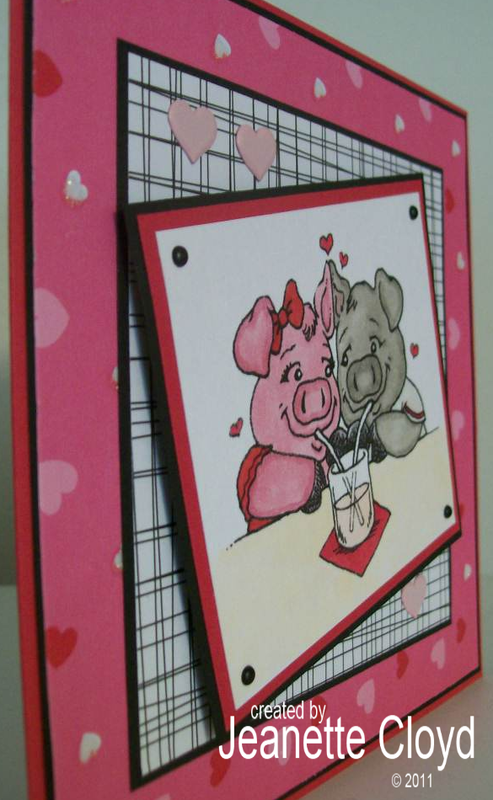 If you want, you can tell us in your blog post who is receiving your card and how special they are to you. 5. I know there is a lot of cute DP and stamps out there with a sewing theme, so if you have those go ahead and use them. But if you don’t have them, don’t fret-they are not necessary. 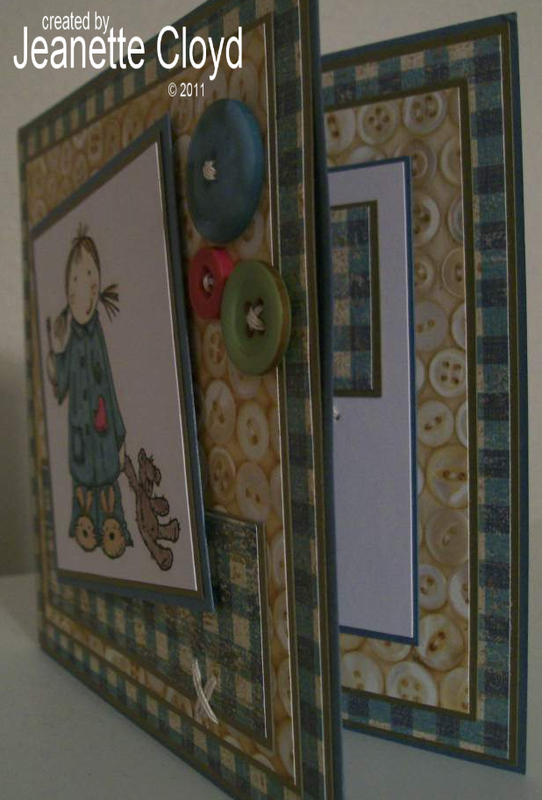 Just please have the sentiment, button and stitching on your card for sure. Hope you enjoy the theme and HAVE FUN!!! Easy peasy, right? Well, perhaps for some of us. (Tee Hee!) Be sure to check out the blogs of all the Calendar Girls (you can find links to them in my lefthand sidebar). You will discover that not all of us are handy when it comes to sewing. LOL! Many of my stamps are still in boxes, waiting to be unpacked. I'm pretty sure I have some that have a sewing theme, but nope! I couldn't find them. So I decided to use a cute little Sugar Nellie stamp that I have. After all, it shows the sweetest little girl with her friend - Teddy Bear! You must must look at this precious image a bit closer. Isn't she sweet? 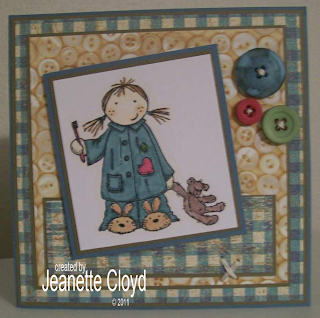 Did you notice the hand stitiching I did? 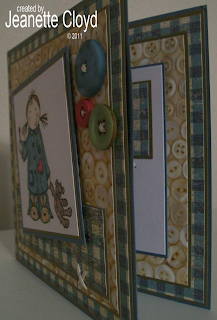 I stitched an "X" on the cardfront (there's also one inside) and of course I just had to stitch the buttons on, too. I really do hope to drag out my sewing machine one of these days and try using it to sew on a card, but that didn't happen this time. I'm sorry, Debbie. I hope you aren't too disappointed. See, I told you there was an "X" sewn inside. I also put my computer-generated sentiment inside. 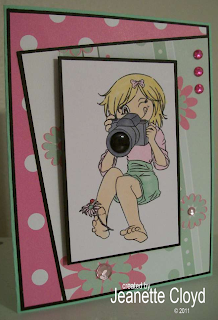 I hope you don't mind, but I prefer to keep the identity of the friend I'm sending my card to a secret. But I do love the idea! Thanks for a GREAT challenge, Debbie! I loved it SEW much!!! Now, let's go see what the other Calendar Girls created! 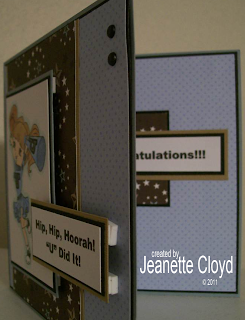 Craft Us Crazy Challenges last TWO weeks so you still have time to participate in the current ANYTHING GOES challenge. Pixie Cottage is offering a very nice prize package. 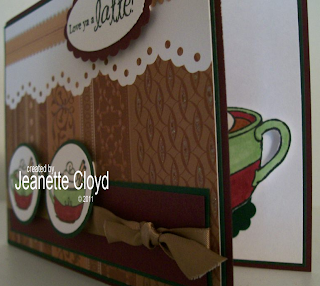 In addition to that, they graciously gifted the Craft Us Crazy design team with images/stamps to use for the challenge. 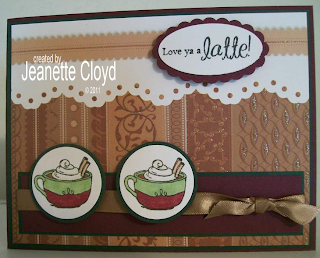 I was sooooooo excited to receive the Love Ya a Latte stamp set!!! Thank you Pixie Cottage!!! 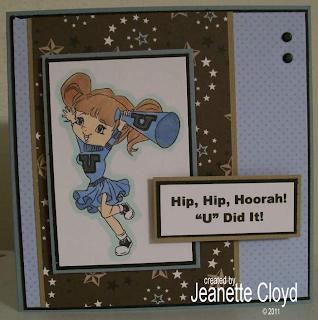 This stamp set is fabulous!!! It features several images, so I couldn't choose just one. 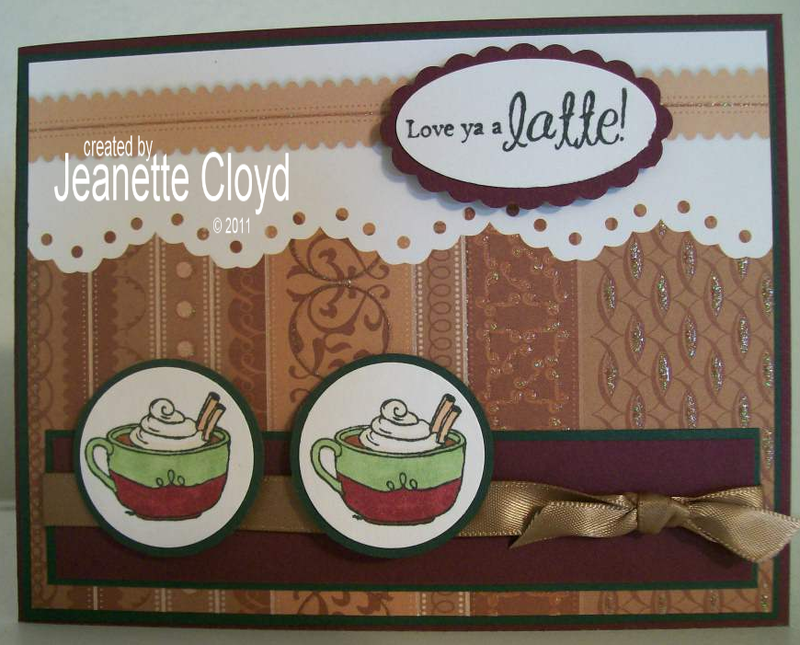 I put two delcious cups of yumminess on the front of my card, along with the sentiment. 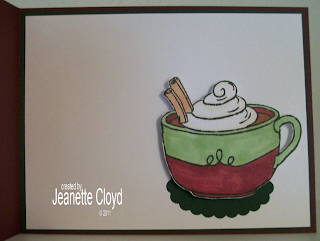 Inside the card, I put the larger cup of delight! 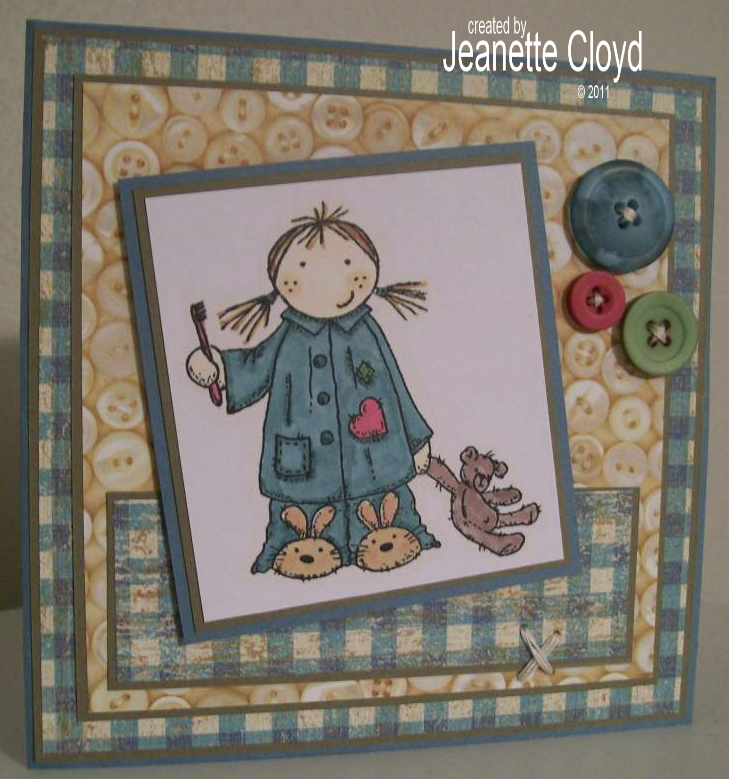 Remember, the Craft Us Crazy Challenge is ANYTHING GOES... so come on and join the fun! It seems that everyone loves an ANYTHING GOES challenge. 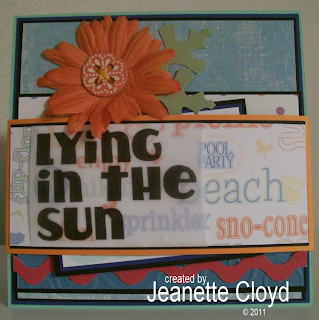 The last Craft Us Crazy Challenge was ANYTHING GOES, too... and it had 665 participants!!! WOW! That's fantastic! I hope you were one of them... and I hope you'll join the fun again with this challenge! Robyn's Fetish is this week's sponsor of the Craft Us Crazy Challenge. 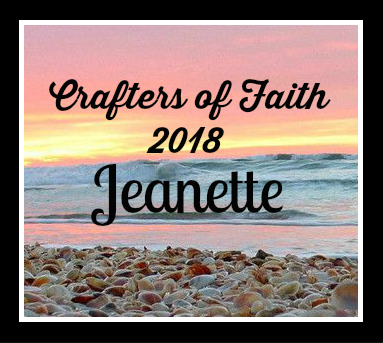 Not only are they offering a very generous prize package to a challenge participant, but they also gifted the Craft Us Crazy design team with an image to use for this week's challenge. Oh, and did I mention... Robyn's Fetish has a sale going on! YAY! All of the digi imges are 20% off through the end of the month, so rush over there and check them out! Oh my goodness! 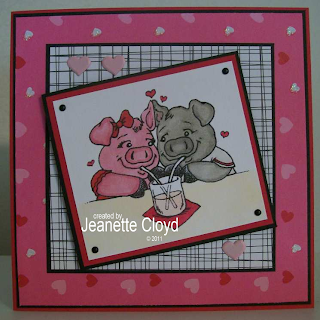 There are so many fun images to choose from! -- Let's Keep It COOL!!! This is the 15th of August - which means it's the day for the Dueling Darlings to post this month's cards. If you aren't familiar with the Dueling Darlings, we are a group of online friends who have a bit of a challenge each month. We are two teams - the Divas and the Dazzlers (I'm a Dazzler). 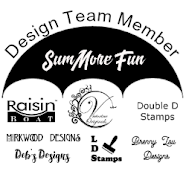 Each month each team has a hostess and the two hostesses choose a theme for that month and then send out kits to their team members. 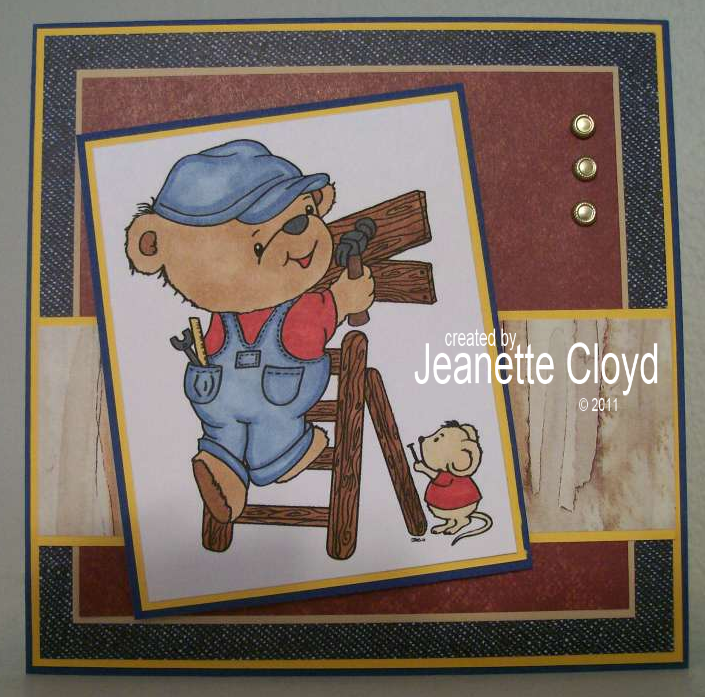 Kits include images, papers, and embellishments. The team members create and we all post on the 15th. It's great fun to see what each Dueling Darling creates... and to see the items each team has to work with. This month Paola was the Dazzler hostess and Judy was the Diva hostess. They gave us the theme IT IS HOT!!! LET'S KEEP IT COOL!!! Paola sent us the most incredible kits... so many mny goodies with with to play. I tried, but I simply could not use all of them, there were so many. Thank you, Paola, for making the August round so much fun!!! My card is a bit of a mystery card. LOL! 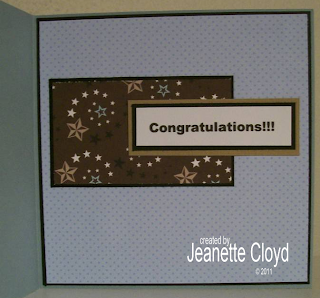 I created a band that wraps around the card and put the fun beachy designer paper and the vellum sentiment on the band, which actually covers up about 1/3rd of the card front. When the band is removed, you get to see the entire card which includes the adorable image of a chick floating along in the water. I thought you might want to see a closeup of the image. Paola gave us a challenge along with our kit. We were instructed to share a fond memory of our favorite way to keep cool during hot summer days. For me, it would be to stay inside (where it's air conditioned) and stamp the day away. LOL! Does that count, Sweet P? Paola also asked us to share our favorite cool drink and a recipe, too, if we are willing. Truthfully, we drink a lot of iced tea at our house - year round! So that is the beverage I enjoy most often when trying to stay cool. However, my favorite treat is a Starbuck's Frappuccino (why is no one surprised by that???)... and currently, my favorite flavor of those is the Mocha Coconut Frappuccino. It's really a very good thing that the nearest Starbuck's is well over an hour away... otherwise I'd gain a lot of weight and be much poorer, too. First things first, prehead the oven to 300 degrees F. Spread the 1/2 cup of shredded coconut on a baking sheet. Put in the oven to toast. In order to get the coconut evenly toasted, you will need to stir the coconut around about every 10 minutes or so. It should take 25 to 30 minutes to get the shredded coconut a nice light brown. Let it cool. Now to make the double strength coffee. It's really quite simply. Use your drip coffee maker but use twice as much coffe as you normall would. This means use 2 tablespoons of ground coffee for each cup of coffee that you wish to make. Chill coffee. Now, on to the fun part of actually making the drinks! In a blender combine 1 cup of cold coffee with 1 cup of low-fat milk, 1/3 cup of toasted coconut, 1/3 cup of chocolate syrup, and 3 tablespoons of granulated sugar. Blend for 15 to 20 seconds in order to dissolve the sugar. Now, add ice and blend until the ice is crushed and the drink is smooth. Pour the contents of the blender into two (2) 16-ounce glasses. 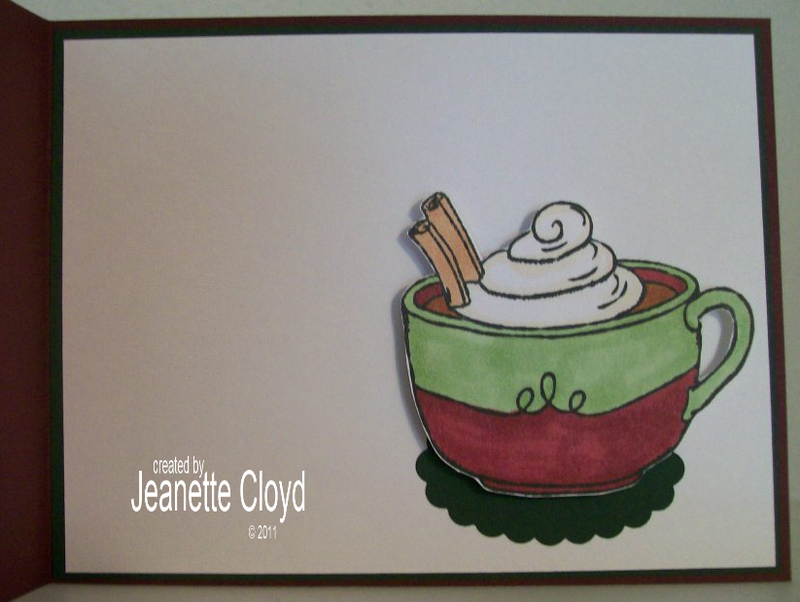 Garnish each drink with whipped cream. Drizzle chocholate syrup and add a pinch more of the toasted coconut to top off the drinks. Enjoy! I must give my sincerest apologies to Paola (and to all of you viewing this post, too). 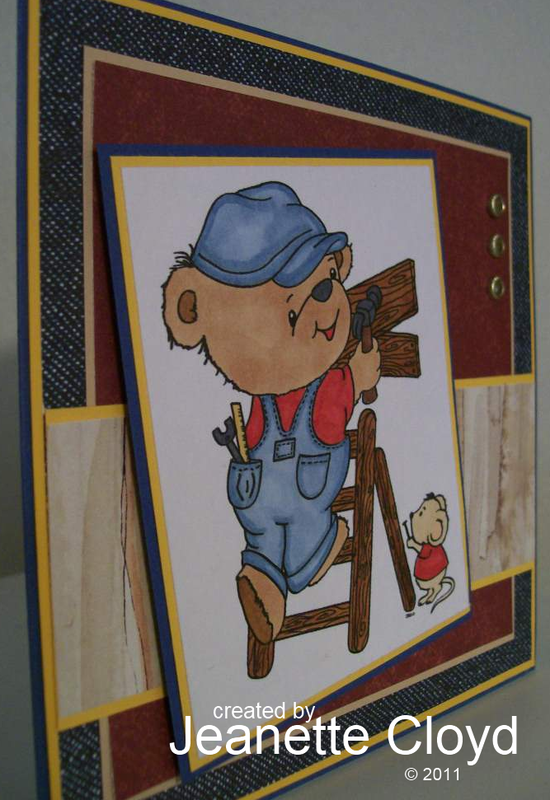 I'm sorry, but I cannot find the product list, so I can't tell you what items were used for this card. 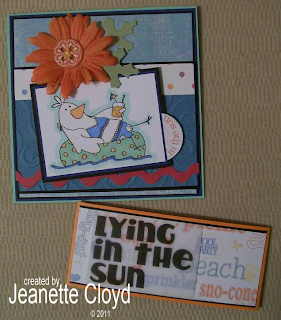 Craft Us Crazy is having an ANYTHING GOES Challenge this time... be sure to join the fun! 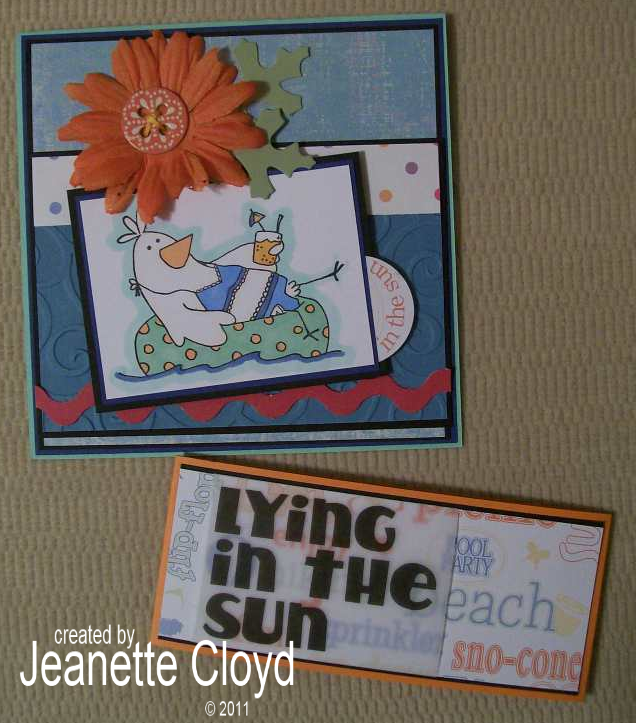 Di's Digi Downloads is a sponsor for the Craft Us Crazy Challenge. What a delightful company... with some really cute images. I ♥ Di's Digis!!! 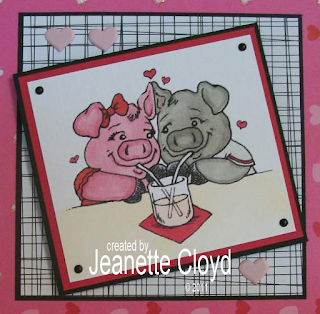 Di's Digi Downloads is offering a prize package of 5 free digital images of the winner's choice! 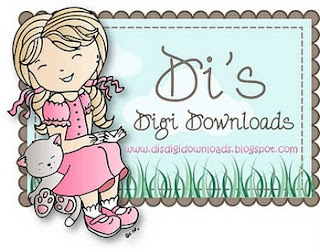 Thank you, Diane (the creator of Di's Digi Downloads)!!! 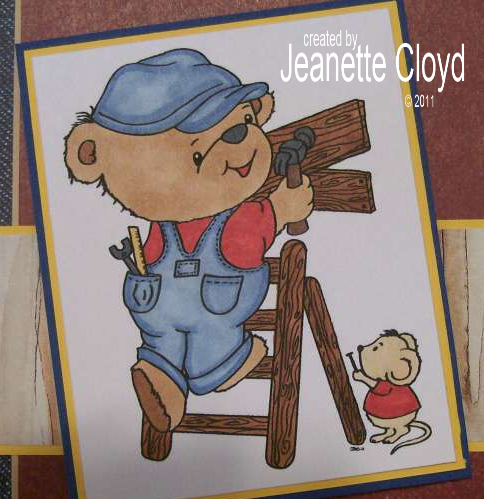 Isn't the little helper adorable? 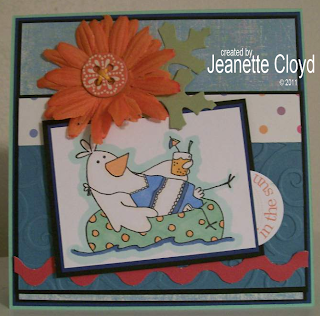 It's time for a new challenge at Craft Us Crazy! 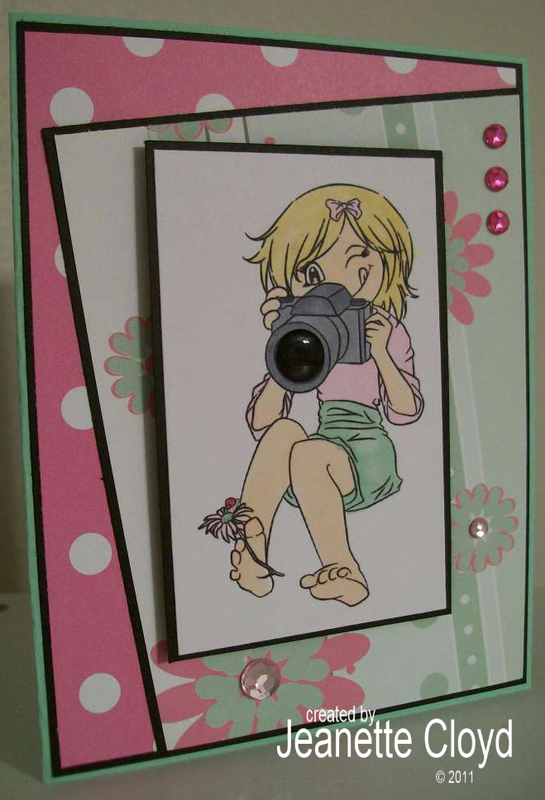 As a Craft Us Crazy design team member, I was given a Kelley Kid's Abby's First Camera digi image to work with. Isn't she darling??? 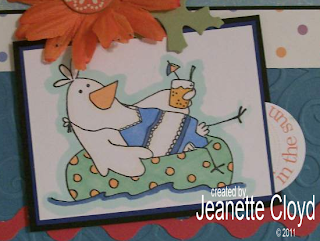 Thank you, Kelley Kid's, for sponsoring Craft Us Crazy and for giving me the image, too! 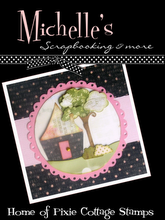 Now, everybody get crafting... remember, it's Anything Goes at Craft Us Crazy! I love brand new things... new clothes, new gadgets for my kitchen, new cars! Since moving a month ago, I've had the joy of buying some new things, too (new sofa and matching reclincer, new chest for the bedroom, new bright red KitchenAid mixer, etc.) I am a happy woman! LOL! I'm also HAPPY to tell you about a BRAND NEW challenge! 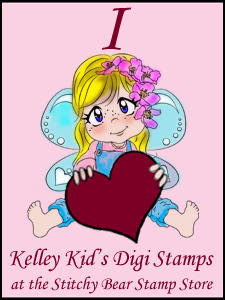 Kelley Kid's (the digital stamp company with lots and lots of cute images) now has a weekly challenge. 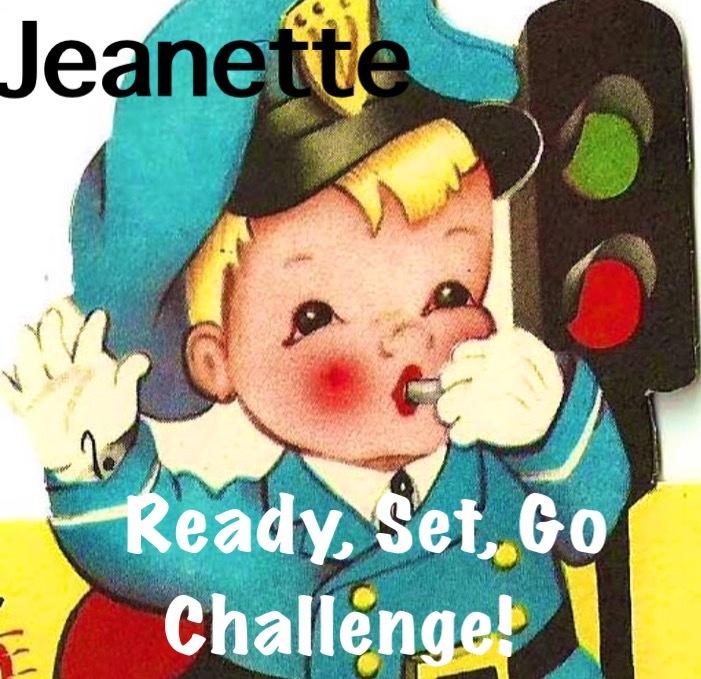 And today is the first day of the very first challenge! It's ANYTHING GOES and you have an entire week to participate. (You can only submit one entry). Check out the details on the Kelley Kid's blog and be sure to snag the FREEBIE image while you're there! Congratulations, Kelley Kid's... I wish you much success with your BRAND NEW weekly challenge!